I’ve got another cold and I always resort to the old tried and true 4. 1. 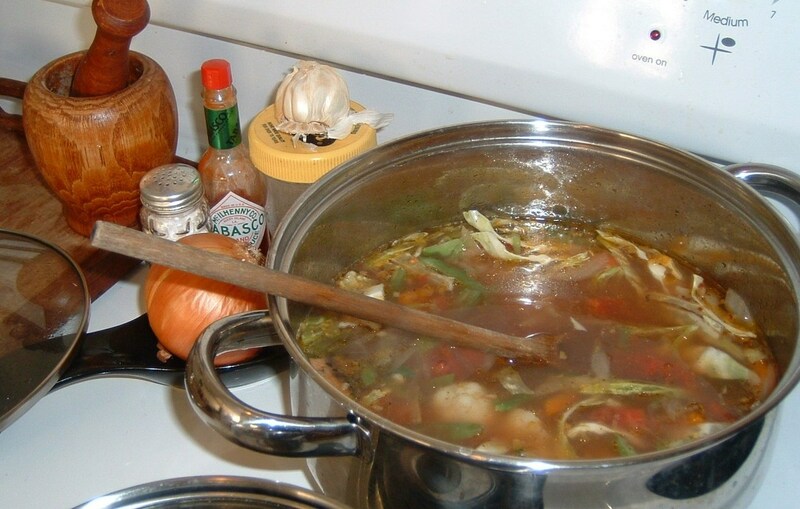 Does chicken soup cure the common cold? No, but it sure eases the symptoms. One Mayo clinic study I read years ago found that it promoted the flow of phlegm so ridding the body of the virus quicker. I’ve had a crockpot of it going for 2 days now and I’ve been sipping the broth throughout the day and replenishing the broth in the pot. An hour before supper, I might add some vegetables, more onions, more garlic and turn it up before actually serving myself more than just the broth. Immediately deglaze pot with white wine, vermouth, or chicken broth and water to fill pot. Add favorite veggies only an hour before a meal, if you want so they’ll be a dente and not mush. 2. Does a hot toddie cure the common cold? No, but it also eases the symptoms and I personally believe it speeds recovery. My earliest memory of this particular remedy goes back to early childhood. 8-12 ounces of boiling water or tea. Sip slowly, then wrap up warmly and go to sleep. As a child, I assure you I went to sleep and woke up wet from sweat and ready to go to school. As I’ve grown older, it takes 2-3 such toddies to, but the effect is the same. 3. Do you really have to drink so many fluids and why? Yes you do and the reasons are many. The body loses fluids in a variety of ways: constant blowing of nose, fever and sweating, mouth-breathing. Remember teas are okay if herbal and not diuretic – water is the best. Flavor it with some juice concentrates, or stir in some frozen OJ or Apple Juice. 4. Does the adage starve a cold, feed a fever have any merit? I know that feeding a fever makes sense as we’re burning more calories. But the starve a cold part probably comes from the fact that appetite disappears when you have a cold, or at least mine does. I notice I eat less and on the upside, I drop a few pounds. This close to the over-indulgent holidays, that’s a welcome reward for surviving the cold.